After building a couple of wood aircraft I decided the D.VII must have visible wood in the cabin. I also wanted to enclose the space a bit to allow more flexibility for planting a foot while climbing in and out and to catch any debris that might find its way to the floor. 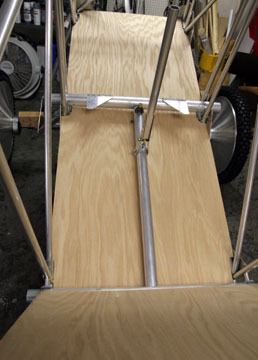 1/4" oak ply was bought at Lowes Aviation and the whittling began. This was a process of measure, trim, fit, measure, trim, fit, etc, etc until it was possible to work the pieces around/between the tubes. 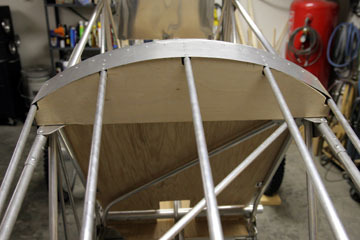 Aluminum tabs with nutplates will be fabricated and riveted to longerons to secure the panels. There is only one way some of the panels can be inserted into the fuse...and after the plane is finished they would probably have to be cut for removal. 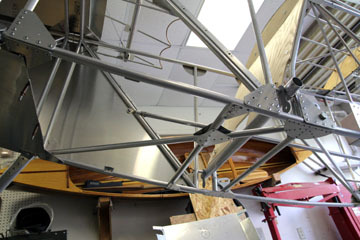 The lower wing is a pretty big step from the ground. Convenience (and mature knees) dictated an intermediate step. Here is a pocket step installed on the lower fuse longeron. 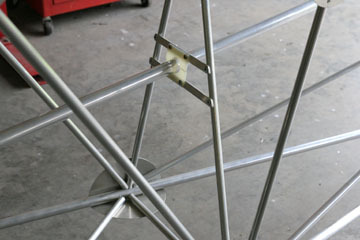 In order to prevent damaging the longeron, 3/8" aluminum tubing supports were hung from an upper longeron cluster gusset to distribute the load. 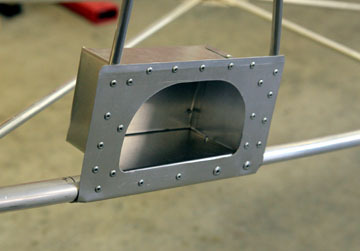 The step is a simple box bent up from leftover pieces of 0.025" 6061. The bottom of the box rests on the longeron. 2) The difficulty of designing satisfactory guides to accommodate both planes of motion while still stabilizing the tube. 3) The angle of the pushrod created the need for locating the seat much higher than I want. Here is the pushrod design I installed to address the above issues. A relatively short, stiff push rod connects the control stick to a 1/2 bellcrank located 4' aft of the stick. 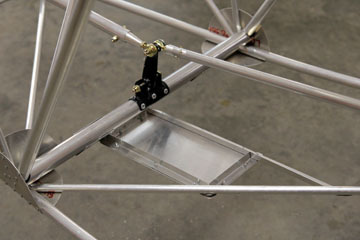 An additional fuse member was added to provide a mount for the bellcrank. 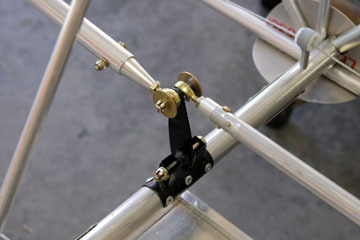 Rod end bearings allow the stick to have full lateral movement for the ailerons. The mount and bellcrank are 4130 steel and the pivot is an AN4 bolt running in a steel bushing. The bellcrank should be routinely inspected so an inspection cover was located nearby. The frame is 0.5" x 0.5" 6061 sheet angles and the cover is 0.025" 6061. Update: The cover was changed to clear plexi for ease of inspection. Here is the finished version complete with large area washers to prevent complete failure of the rod end bearings. Here you can see the entire run to the elevator. Notice how close the first pushrod is to the spar carry-through which allows the seat to be set very low in the fuse. One guide was installed for the longer, aft pushrod. It is 1/8" nylon split so it can be removed without disturbing the pushrod. 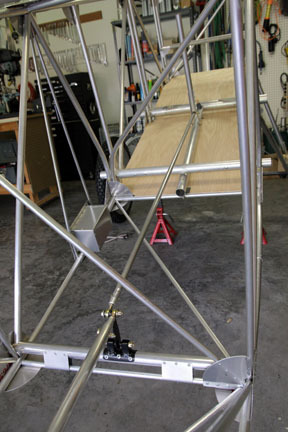 Here is the seat base being mocked up. 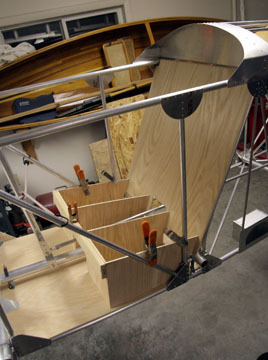 Since the base needs ribs to make it tolerate a hard landing, why not use the space as storage compartments? Update: After reflecting on the loads imposed on the floor under the seat during a hard landing, I decided that area needed to be stronger. 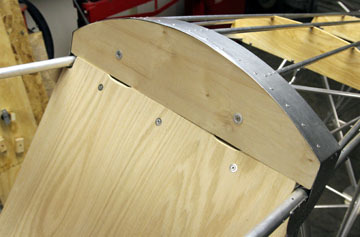 There was only one diagonal supporting the center of the floorboard and it was attached with a light gusset. I cut the diagonal tube and added a 7/8" fuse crossmember attached to the longerons with heavy gussets. 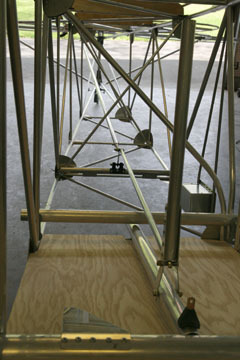 The diagonal was secured to the new tube with double gussets. That area is now much stiffer. 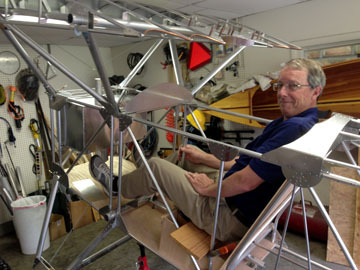 With help of Aviation friend Greg I was able to squirm into the fuse so we could set the location of the rudder pedals. If you look closely at the photo above, you will see the large crease in the turtle deck skin that I caused while getting in the cockpit. For a few moments, it appeared I had built a plane that I couldn't get into. 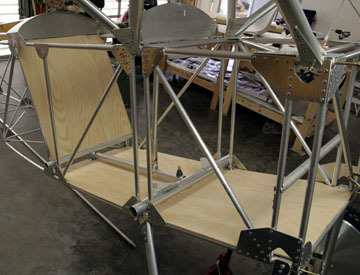 There is precious little clearance between the turtledeck and the trailing edge of the upper wing, even with the small cutout. A major problem was not being able to apply any weight to the turtledeck as I slid into the cockpit. 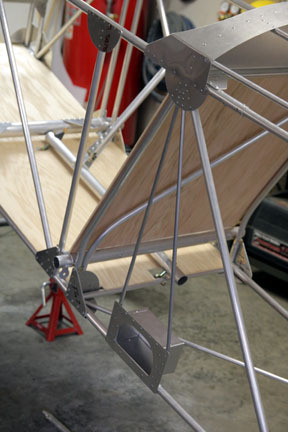 The turtledeck isn't designed to carry the weight of a large pilot wriggling into the plane. Here is my "solution". Since the leading edge of the turtledeck was trashed anyway, and I needed more clearance, the skin was trimmed back to where it would be flush with a 1/2" ply former that was added to the bulkhead. The removal of the lower corners of the deck also yielded more maneuvering room. Also visible are the slots where the shoulder harness enters the cabin. 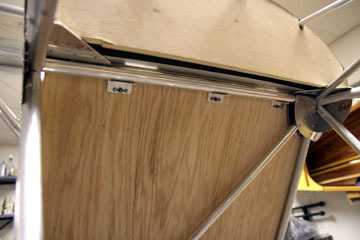 The stainless countersunk screws fasten to platenuts that are attached to fuse members via aluminum angles. To make the bulkhead carry the pilot's weight, I added another ply former at the rear of the bulkhead. This resulted in a very strong and rigid fuse member that won't be damaged as I sit and lean on it while getting into and out of the cockpit. The plane is still a very tight fit and I may modify the wing trailing edge a bit but the bulkhead mod was a major improvement.